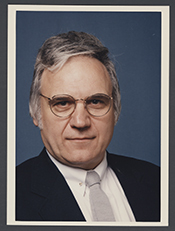 TRAFICANT, James A., Jr., a Representative from Ohio; born in Youngstown, Mahoning County, Ohio, May 8, 1941; graduated from Cardinal Mooney High School, Youngstown, Ohio, 1959; B.S., University of Pittsburgh, Pittsburgh, Pa., 1963; M.S., University of Pittsburgh, Pittsburgh, Pa., 1973; M.S., Youngstown State University, Youngstown, Ohio, 1976; executive director, Mahoning County, Ohio, Drug Program, Inc., 1971-1981; sheriff, Mahoning County, Ohio, 1981-1985; elected as a Democrat to the Ninety-ninth and to the eight succeeding Congresses (January 3, 1985-July 24, 2002); expelled from the U.S. House of Representatives on July 25, 2002, for conspiracy to commit bribery, defraud the U.S., receipt of illegal gratuities, obstruction of justice, filing false tax returns, and racketeering; unsuccessful candidate as an Independent for the One Hundred Eighth Congress in 2002; died on September 27, 2014, in Poland, Ohio. Oral History: 1985, 19 leaves. An interview of James A. Traficant by Evelyn Mangie concerning the Westlake Terrace Project, conducted on October 15, 1985. The interview was part of a project titled: "Youngstown from the 1940's to the 1980's, political conditions, sports program."